This movie the first of three based on a series by Veronica Roth. I liked books fine and I think as an adaptation they did an excellent job. I like Mr. Kamal Pamook a.k.a. Theo James as Four and Shailene Woodley did an excellent job as Tris. This is a good movie and worth the price of a ticket to see it in the theater. The story is about a futuristic society and how the government and people in it run. The beginning is with Tris Prior and her mom played by Ashley Judd. They are living in a group of people or Faction called Abnegation. The society is divided into five total factions: Abnegation, Amity, Candor, Dauntless and Erudite. Each faction follows certain values and have very distinctive lifestyles. This is the story of the people in this world and how their world evolves. It is a great story very similar to The Hunger Games. I have heard several reports that the future of Young Adult novels being brought to screen depends on the success of this series. Whoosh that is a lot of pressure on one series. I find fault with this mentality. The movie producers are so in the wrong here. Their rationale is based on the success-or lack thereof- from recent YA productions. I have read all of the recent series this is theory is based on and many others. MOST of them should NEVER have been made into movies. City of Bones is one example. It was a meeeh book and the rest of the series was no better....perfect example of something you should not make into movies. Know your source material. Look at who is reading these books and if they are really loved by their target audience. From all I have found out I was not the only one who thought this way about this series. Why, as a movie producer would you make a movie based on a book series that was moderately well received at best? Even if the movies are excellently based on the books or the movie is beyond awesome, your target audience is not really all that likely to go see it in the theater where you make the most money. If they do not go to the theater and like it they will not buy the merchandise. This is where Twilight was so successful. They took a series that was beloved for YEARS before they ever took it into production. The movies were HORRENDOUS and still the studio cashed in. The actors and production was miserable at best but the characters and story they portrayed were so beloved that the fans sucked it up. The merchandise took over Hot Topic for years...yuck by the way. So beloved was this series that it had some horribly written fan-fic make the best sellers in Fifty Shades of Gray. I can not wait to see this adult themed movie come to screen and I hope they let it be a NC-17. YAYAYAYAYYYY!@!@!@!@! 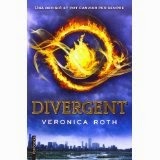 I think Divergent is a great story and they have taken story and done it justice. I can't wait to see he second movie in the series, Insurgent.